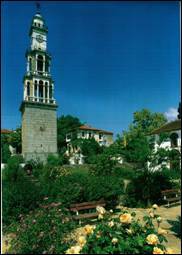 Argalasti is built on a fertile field 40 km southeast of Volos, a weighted average altitude of 250 meters above sea level (196 meters to the main square). It is a major tourist (and local shopping) center in the region, as one of the village with a rich cultural tradition and a landmark for those heading to the nearby beaches of Pagassitikos (grass, reed, LEFOKASTRO) or the open Aegean (Sprinklers, Ink , Paltsi). The region is very fertile and produces oil, grains and fruits. Also thriving livestock. Excellent example of local architecture of the early twentieth century is the steeple of the church of the Holy Apostles, and embedded in the walls of many structures are parts of ancient and medieval buildings, which adds to the ambience of the village. The entire settlement is visible from the Monastery of St. Nicholas Pau.